The good performance of a computer requires monitoring driver software installed in it. 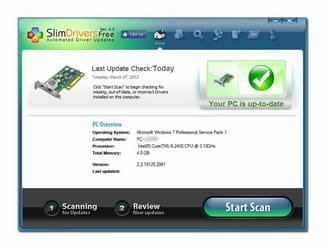 SlimDrivers is a program which will detect and install driver updates. Scan: Once installed on your machine, SlimDrivers will proceed to an analysis of the operating system, in order to detect integrated drivers. It will then be able to detect any failures, such as the occurence of a corrupted file. Downloading: Once the analysis done, this program will display all the necessary updates on its processing interface. A manual downloading function then becomes available for their updates. Back-up: To protect the drivers from file corruption, SlimDrivers offers the possibility to back-up the ones already installed in a secure space. These files will then be protected against viruses attacks. Recovery: In the case where drivers are damaged, this program can recover them from the last backup. This function is accessible from the recovery option in the main menu. This program's interface is user-friendly. Latest update on October 21, 2015 at 04:40 PM.